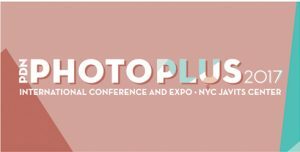 I spent most of Thursday and Friday last week (October 26–27, 2017) at PhotoPlus Expo 2017, which was held at the Jacob K. Javits Convention Center in New York City. This annual show is the imaging industry’s largest (and dare I say only) true consumer show. As such, I usually use it as a bellwether on how the holiday season might shape up. 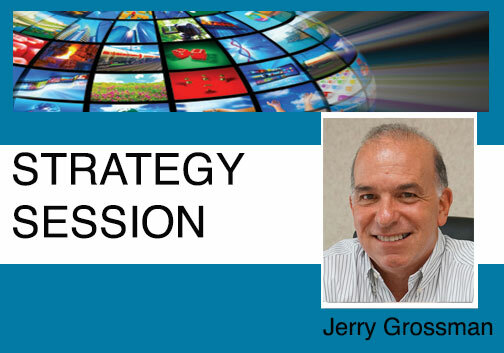 The event continues to be a yearly rite of passage for most of the major imaging brands. It gives them a chance to strut their recent stuff and interact with their enthusiastic customers. (Kudos to Emerald Expo’s Lauren Wendle and her amazing team for continuing to stage this event.) All of the brands you would expect were there this year. But to me, the story was how they represented themselves and the enthusiastic crowds that were soaking it all up. I have to start with the crowds. 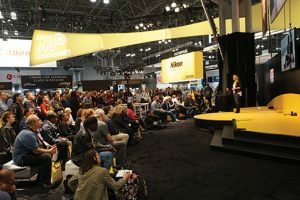 They were impressive—from the lines to secure badges to the standing-room-only throngs at just about all of the in-booth stage presentations. There is still clearly a strong appetite for appreciating the work of professional photographers—and for learning the techniques that have put them on those stages. Enthusiasm permeated the halls for most of the two days that I was there (and even more crowds were expected on Saturday). There were two- and three-deep waits at many of the product counters. This only speaks well for the continued interest in the nuts-and-bolts products of the imaging industry. 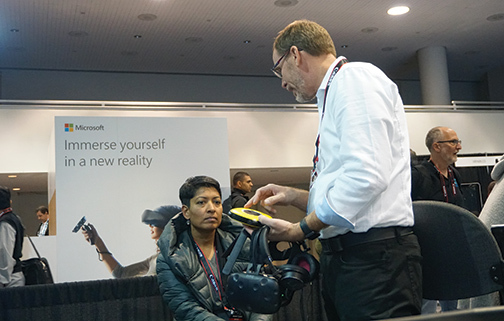 The event is also a unique opportunity for consumers to speak directly to the manufacturers who offer these amazing products. And for the brands to give their best sales pitches for their products’ unique capabilities. Clearly, some of the major brands beefed up their booths this year. Sony moved to the front of the convention hall and visibly raised the bar with an expansion of their footprint from last year. Canon and Nikon also demonstrated their strengths and broad product spectrum with their usual brashness. 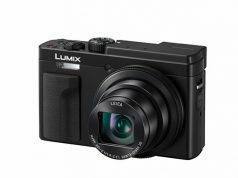 Each of those three brands, plainly fighting it out for “interchangeable-lens camera dominance,” seemed eerily comfortable working next to its largest competitors. This was a testament to our “we’re all in this together” mentality. However, it was some of the less-expected brands that stepped up this year to beat their chests a bit. Olympus was obviously feeling optimistic, with an expanded show display. The same was true for Panasonic. Most impressive was Fujifilm, which now offers one of the industry’s strongest one–two punches: their renowned X-series pro cameras and their drive to demonstrate the resurgence of consumer printing. By my estimation, their booth seemed at least 50% larger than last year. 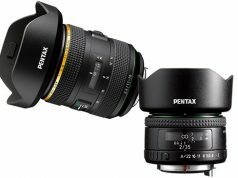 In addition, lens manufacturers Sigma and Tamron were also impressive in their new product lineups. Sigma is bullish on their new Cine lens business. And Tamron continues to expand their zoom lens lineup that has taken a front seat in the industry. There was also enthusiasm for some of the stronger accessory distributors, who were eager to show their wares. 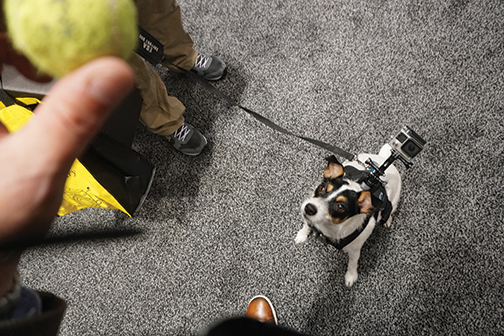 Manfrotto showcased their recent additions of Lowepro and JOBY products. Their booth was crowded for most of the show, with their broad array of offerings on display. Moreover, the Sirui booth, an up-and-coming tripod manufacturer, was also two deep. SanDisk also told a great story, and bag companies like Think Tank Photo as well as smaller manufacturers like Kenko Tokina were holding their own. There were also some notable and surprising showings from other brands old and new. 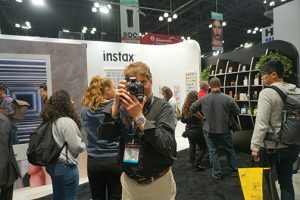 Polaroid Originals took a step back in time with their OneStep 2 Polaroid instant analog camera and film. A true throwback to the 1970s, maybe it’s a sign that retro is cool again, along with vinyl albums and paperback books. I also saw a remarkable product called Joy. It’s a wireless photo album that is a cross between a small tablet and a digital photo frame. It’s certainly worth checking out. Jim Malcolm of Humaneyes Technologies demonstrates the Vuze 360 3D camera. My talk with Humaneye’s Jim Malcolm, the de facto spokesman for this segment’s foray into imaging, left me with the impression that there needs to be more education on how to sell these products at photo specialty locations. Finally, our industry’s commitment to growing together was on display at the Imaging Alliance’s mixer. It was held at Casa Noona after the show on Thursday evening. The mix of the 65 attendees, who included representatives from manufacturers, dealers, printers, photographers and media, demonstrated the camaraderie that’s reemerging in our industry. It was a clear message that we’re all working together toward the same goals. To that I say: cheers! Previous articleProfit Prospects: Good Selling to All! 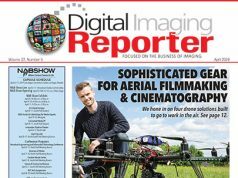 Next articleWhat Have You Printed On Lately for B2B?